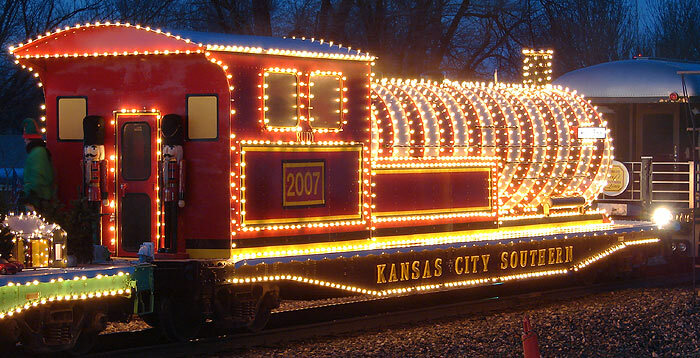 I caught up to an old friend this past Christmas season - the Kansas City Southern railroad's Holiday Express train. 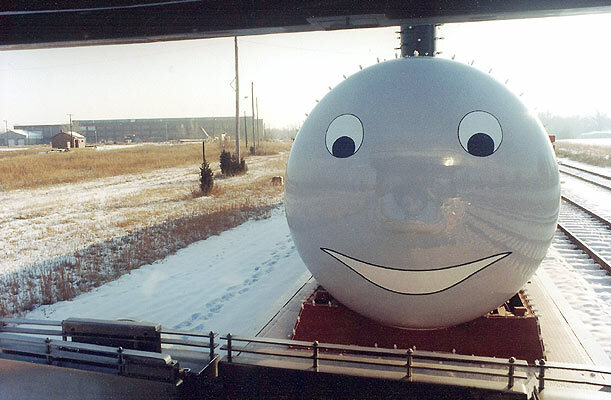 The train was in Drexel, Missouri, too near the end of its 28-stop tour to blog it before the tour actually ended, especially with the ice storm still disrupting power. But if you like what you see here, don't be too sorry you missed it. 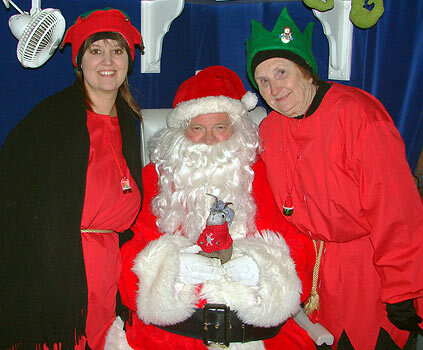 2007 was the seventh year for the train's yuletide tour and I presume you'll get a chance to see it next year. 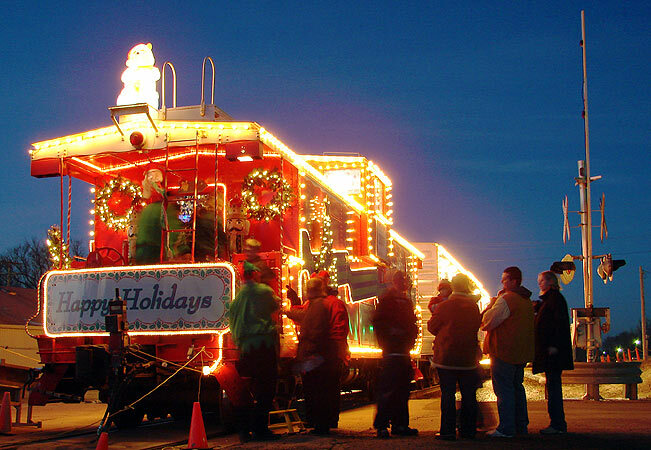 The Holiday Express consists of two cabooses, a flatcar containing Santa's sleigh and reindeer, two converted box cars and a faux steam engine named Rudy. This photo was taken in Joplin, Missouri back in 2002, before one of the boxcars was added. This past year, the train had stops in Louisiana, Texas, Mississippi, Arkansas, Oklahoma, Missouri, Kansas and Illinois. I've seen the Holiday Express a few times over the years, but had never seen a reception like the one in Drexel this past year, in which the locals built an event around the train. Here, girls perform in a tent through which the line to see the train passed. The tent also housed food booths staffed by various local non-profit agencies. I enjoyed a hot dog and some fresh kettle corn while I waited and watched the shows - quite convenient, really. A long line of folks passed through the tent to eventually enter the train, which opened at 4PM, at the trailing caboose. Admission is free. The line reminded me of this picture I shot from the caboose during one of the train's 2002 stops. The kid is probably looking at me because I was dressed as an elf. 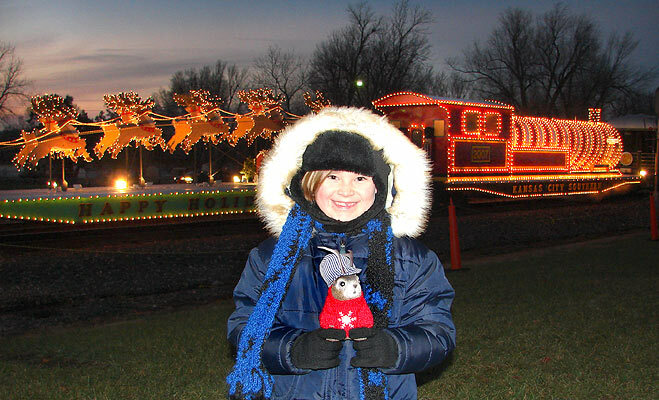 The Holiday Express train is a continuation of a tradition started on the former Gateway Western railroad, which had a Santa Train that ran from East St. Louis, IL, to Blue Springs, MO. 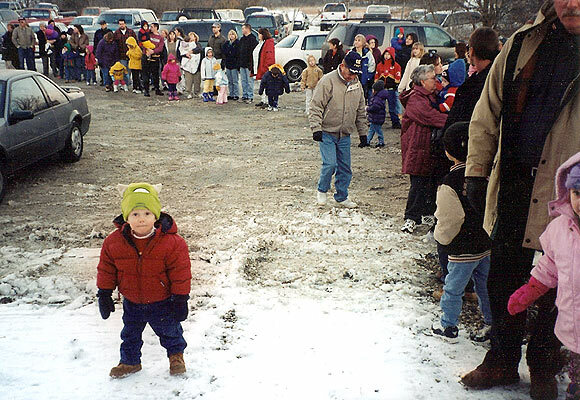 After Gateway Western was absorbed by KCS in 1997, KCS employees noted that the Santa Train was the only Christmas some underprivileged kids had. 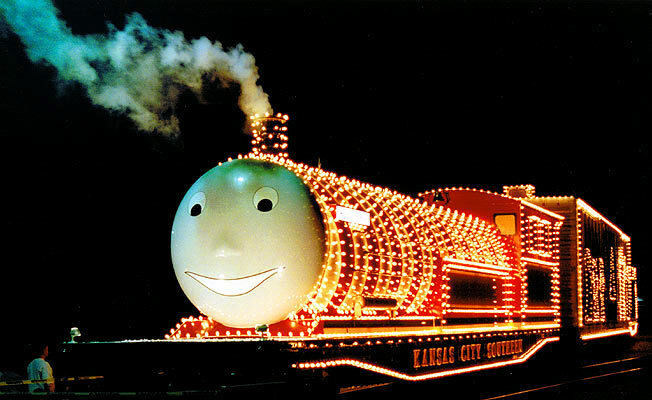 Some of them volunteered to revive the train and by 2001, the new Holiday Express was up and running on the KCS. The stream of people in Drexel finally thinned out at a bit before 8PM. According to KCS press releases, KCS employees, vendors and friends raised $122,700 to purchase Wal-Mart gift cards which were given to the Salvation Army at or near all of the stops. These were used to pay for warm clothing for kids. Major sponsors included American Railcar Industries, CorpLogoWare, DST Systems, Inc., Michael and Marlys Haverty, Kansas City University of Medicine and Biosciences, Kinder Morgan and Watco Companies. KCS and Watco also helped out with steam engine 745's 2006 visit to Pittsburg, Kansas. 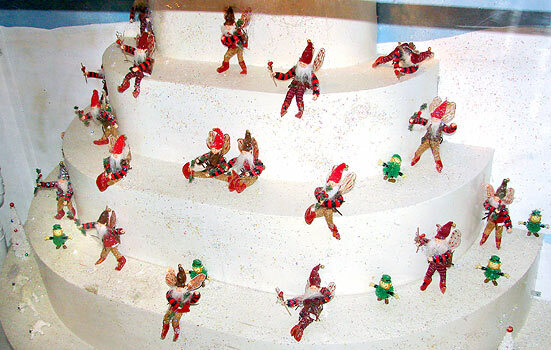 Elves help people up the steep steps into the first caboose. I am told the red uniforms are a newer addition and designate people who are with the train full-time, as opposed to local volunteers. Flashback time. Here are my brother (right) and I in 2002. 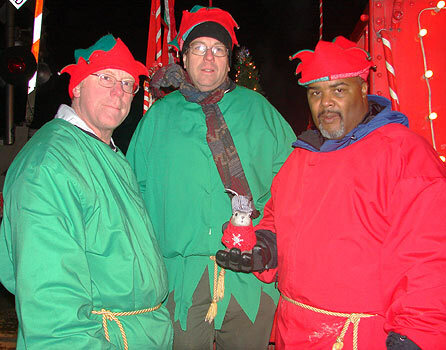 We were elving in Pittsburg, Kansas. It was frigidly cold and I was wearing about four layers of clothing and several chemical warming packs, including one under the pointy cap. Our mother was so proud those college educations weren't wasted. 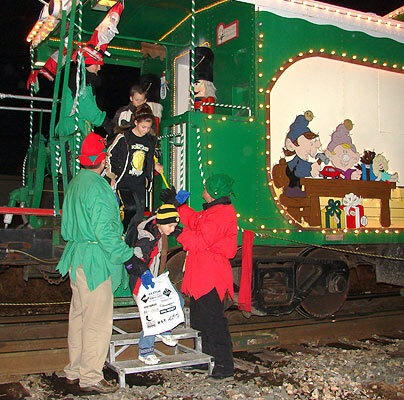 The caboose, like all parts of the train, was painted in Christmas designs and decorated with lights which were activated right before the train opened. The lights are off when the train travels from city to city. Kids wanting to meet Santa were able to get right to it. The first caboose contained the man himself, who took time to hear what Ace wanted for Christmas. 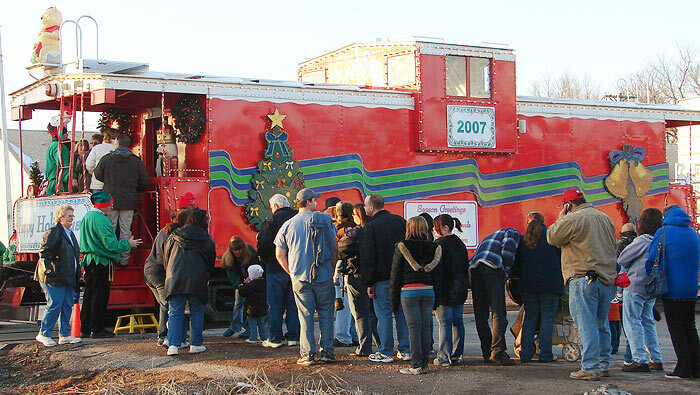 The caboose and boxcar interiors are decorated with various Christmas displays. This past year, the theme was Santa Clause - way to kiss up to the ole' boy. Of course, he did ride along with them, so I guess it worked. I understand this little display is called the ice castle. People are next ushered through this boxcar, which is painted like a reindeer stable. The boxcar contains two model train layouts. 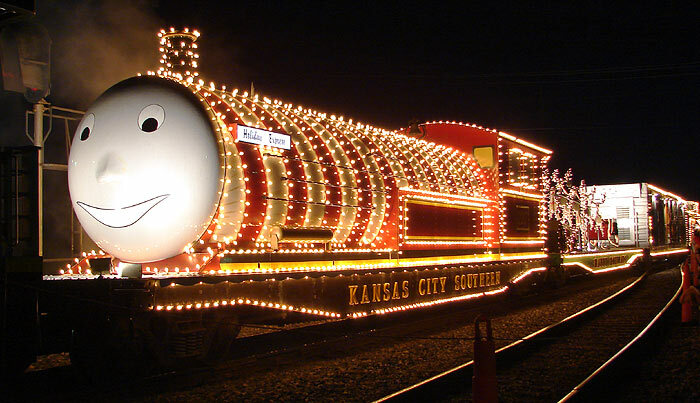 This one featured a model of the Southern Belle, the KCS executive train that actually furnishes the power to pull the Holiday Express on its tour. The Southern Belle no longer wears the black paint scheme on this model. 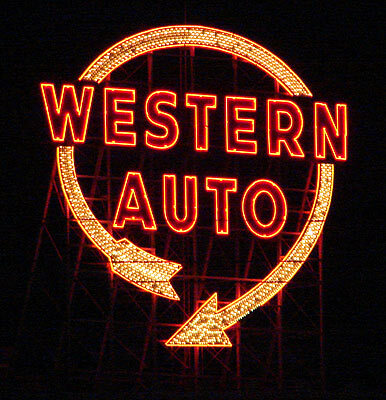 Also note the Western Auto sign, a Kansas City fixture. I photographed the real Western Auto sign this past August. I had also included it in the background with Union Pacific's steam engine, 844, in 2006. 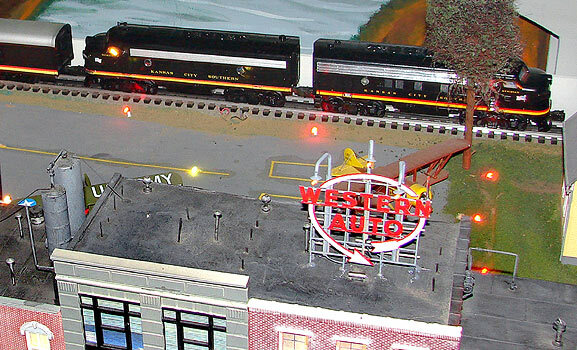 The second layout featured a model of the Holiday Express. So, if the model contained a boxcar with a model train layout within, and that boxcar contained a layout with...hmmm...I guess we can call that the "boxcar paradox." Next in line was another caboose. You can't have too many cabooses ("cabeese"?). 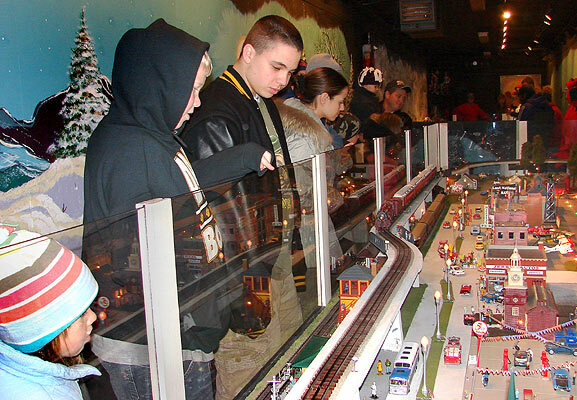 Actually, I wonder how many of these kids had seen a caboose. 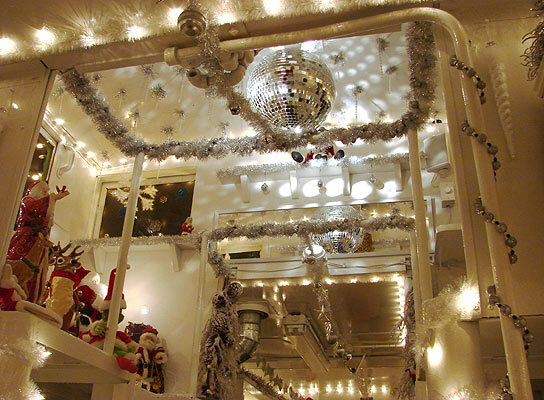 Apparently, Santa has a disco cupola within. 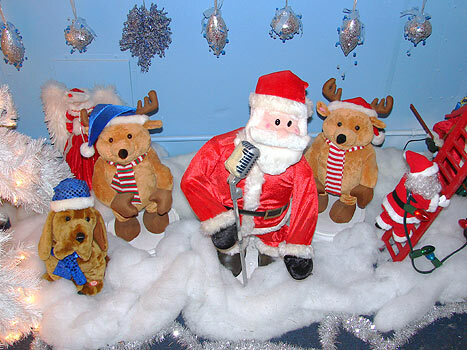 Play that funky music, North Pole boy. This is the end of the interior tour. 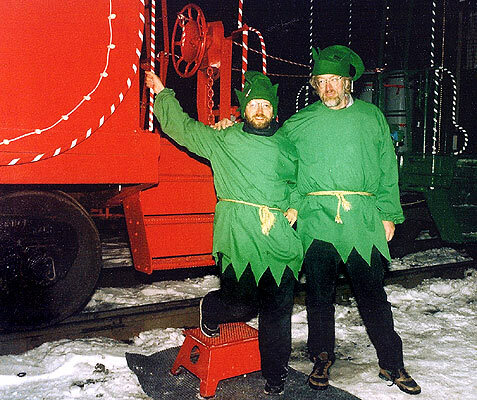 More elves help you off the train at the far end of the green caboose. Kids get a little sack of goodies right before leaving. In 2003 I helped pack the little treat sacks, which contained crayons and small toys that year - not a bad deal, especially as it's free. But there's more to see outside, like this next festive ginger bread box car which, I believe, serves as the elves' workshop. I think I worked in this car in 2003, assembling those goodie bags. 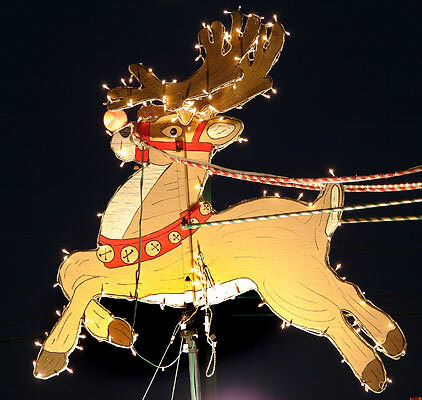 Of course, Santa needs something a bit more airborne than a train to do his job, so a sleigh and eight reindeer are carried on this flatcar. I'm sure that when not simply on display, this guy is "lively and quick." Last in line (going in the direction of the tour), is Rudy, a converted tank car made to look like a steam engine. He qualifies for the best-ever use of a fog machine as the stuff occasionally spills from his stack, as seen here in 2001. 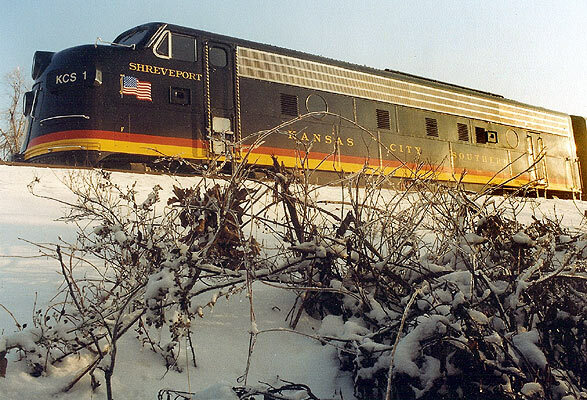 Forward of Rudy is the Southern Belle executive train, the end of which can be seen here in Pittsburg, Kansas, in 2002 when the Holiday Express had a slightly different arrangement. The Southern Belle will be the subject of another post. The passenger cars of the "Belle" house the elves in transit between cities. Many of them actually stay on the train for its entire tour. I shot this picture of Rudy from the rear platform of the Southern Belle during that same 2002 Pittsburg stop. 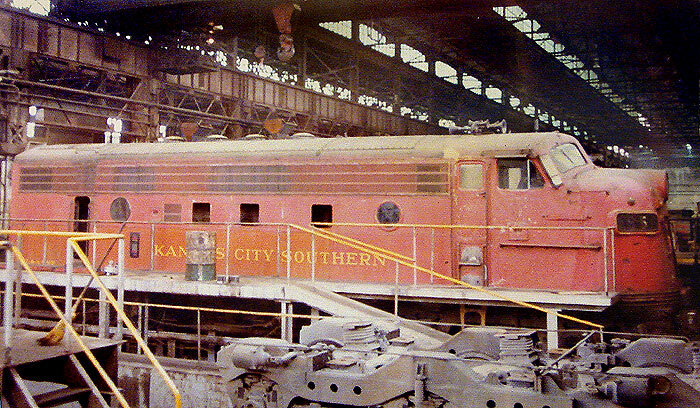 That's the old Pittsburg KCS diesel shop in the background, at left. I spent many a joyful hour there in my youth, shooting pictures of locomotives gone by. 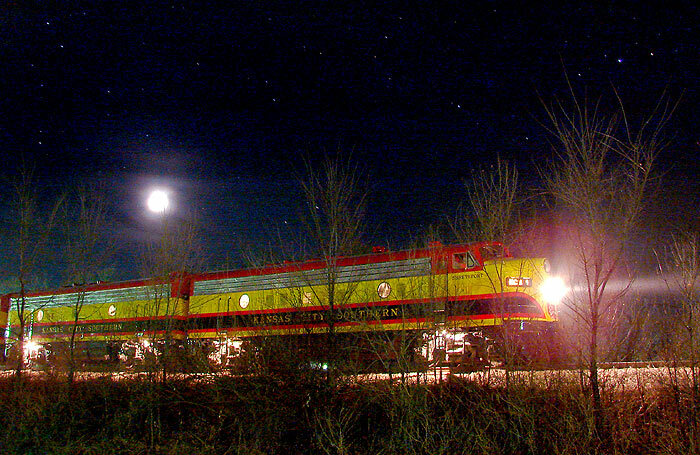 As if six railroad cars loaded with Yule weren't enough, a jewel waits down the tracks that'll quicken the heart of anyone who goes glassy-eyed when thinking about the golden age of passenger trains - and it waits under the moon and stars, just to be more ethereal. 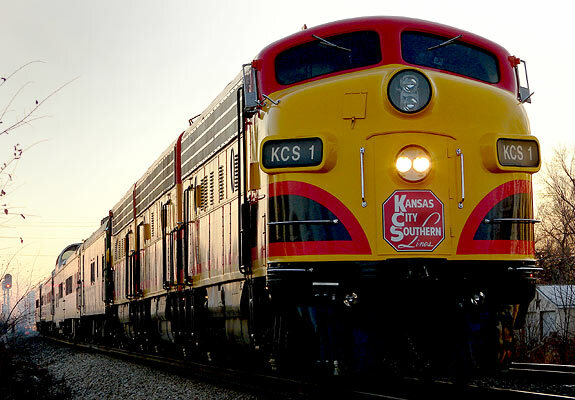 These classic 1950s FP-9 locomotives are what actually pull the Holiday Express as well as the KCS executive train, Southern Belle. Ahh, The Southern Belle - one speaks the name as though remembering a dear departed relative or war hero, long fallen. Although I'm pretty sure the Southern Belle of old was pulled by a larger form of streamliner (E-units, I've read) and certainly not these particular F-units as they are relatively recent additions to the KCS, they are what motivated me to drive the 450 miles round-trip from Hutchinson, Kansas, to Drexel, my nearest point of interception for the train. I paid much photographic attention to them, and they'll be the subject of another post. Of course, the final authority on the train's coolness must rest not with nostalgia-propelled rail aficionados but with those for whom the Holiday Express was intended. Judging from the reaction of Drexel area resident Katrina Barker, it was pretty holly-jolly. 844: Riding the Iron Horse - woo hoo! We get a cab ride! Cincinnati Union Terminal - trains, Art Deco, dinosaurs, neon, Art Nouveau and the Justice League to boot! That photo of KCS1 in the moon light, is just wow!